WE NO LONGER CARRY CHOCOLATE LEATHER. 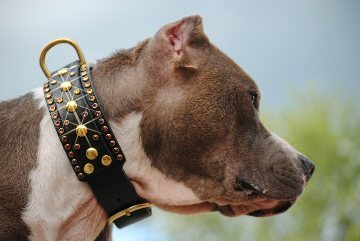 Once you order a collar, we will make it as soon as possible. It is very important to us that we make your dog the best fitting collar, so please take a moment before you order, and measure your dog's neck according to the instructions on this page. 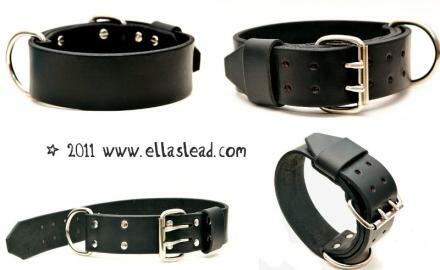 All double leather collars come with a top strip D-Ring unless noted otherwise. If you do not want a top strip D-Ring, please state so in the menu box for questions/comments or "Collar Design Instructions" box. Thank you! ALSO, NOTE: Crystals are not free. In fact, they are rather expensive for us to purchase. They cost a LOT more than acrylic (plastic) spots used on our "Popular Collar Designs". If something is NOT stated to have crystals on it in the product description, but you want crystals on it, do not order and just put that in the notes. Please contact us BEFORE ordering, so we can plan this with you. There will be an additional charge, and due to fact that we cannot change orders once they are placed, it is IMPERATIVE that you email us before ordering. Thank you! ALSO, PT. 2: Ombre and rainbow style designs are not a free add-on (if the collar is not listed already with the option). They are custom. If you wish to have these styles on something you order, please email us. Thanks! ALSO, PT 3: Rewards points are not allowed to be used on custom orders where we have to make a private order page for you. ALSO, PT 4: There seems to be a new craze over super thick dog tags. The collars in this line represent the ultimate luxury in our collar line, with dazzling swarovski crystals and custom created designs. These are designs that have become so popular that they've earned their own spot on our site. These are our Opal collars. These designs are limited and/or can change due to specific opal colors coming and going. These are not genuine opal, they are an opal effect, and are very high quality glass cabochons. Here you will see all the shine, all the time. Here you will find our different varieties/Spin-offs of our popular McStolly Mix collar. Because we all know dogs can totally be steampunk. At least now they can. These are collars that are styled in a timeless, classic fashion. We drew inspiration for these collars from old vintage photos of Bulldogs and American Pit Bull Terriers. Most of these collars are styled from the late 1800's through the 1930's. Because small dogs deserve to have bling too. 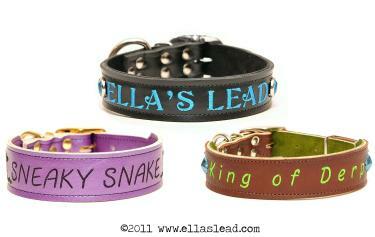 Round up your animals and get ready to check out the latest line of themed collars! 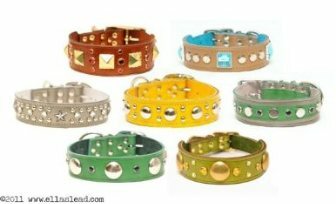 These leather collars are special because they come in a variety of different colors. They are dressy and require stitching. These are our (The) Walking Dead-inspired collars. Whether you want your dog's name embroidered onto his/her collar, or if you'd like a short phrase embroidered on the collar, you can get it here! These are our available cat collars. Ready-to-Walk collars are pre-made and ready-to-go!